Although picking out the perfect venue or decor is an integral part of wedding planning, budgeting for an engagement ring is equally as important. In fact, an engagement ring will be one of the major purchases you make in your lifetime, so you definitely want to spend your money wisely. An engagement ring is a big investment, but it can be difficult to figure out exactly how big it should be. Jewelry businesses favor advising clients to spend the equivalent of two months' salary, but this range isn't right for everyone. 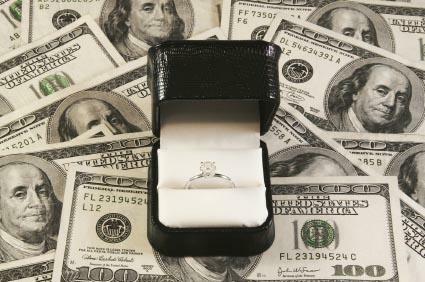 According to The Knot, the average couple spends $5,403 on the engagement ring. Depending on your budget, this figure may be more or less than what you can comfortably afford. Many retailers offer financing options for engagement rings. If you are considering financing your bling, carefully analyze your decision. That money could work harder for you elsewhere, like in an investment vehicle, reports the NY Times. The most important step you can take in beginning your search for that perfect ring is actually free! Learn about diamond grading and pricing and what to look for in an alternative stone, such as an emerald or sapphire. This information will help you determine how much you'll get for your money and how much you would like to spend. What is your current income? What are your expenses? How much wiggle room is there in your monthly budget? Are you going to make another large purchase soon, such as a vehicle or a house? Are you expecting a raise soon? How important is an expensive ring to you or your fiancee? Also, bear in mind that setting an exorbitant budget for the sole purpose of making a purchase that turns heads can also be detrimental to your financial future. Unless you have thousands of dollars of disposable income lying around each month, you'll need to save up to buy the ring. Setting a savings budget will get you where you need to be financially to make this major purchase. Here are some ways to save for an engagement ring purchase. When coming up with a budget, you analyzed income and expenses to gauge affordability. Now, it is time to revisit that list of expenses to determine which non-necessities can be reduced or completely eliminated to free up funds for the purchase. Establishing an amount to save weekly or biweekly will help you meet your savings goal in a timely manner. You should set up an exclusive engagement ring fund to ensure the money remains untouched. If possible, increase the amount over time. If you get a tax refund, bonus, or other windfall, you can choose to put this money toward the ring. You should do this immediately since it is very tempting to blow through any unexpected income that comes your way. Do you have creative talents, such as freelance writing or painting, that will enable you to earn side income until you reach your savings goal? If so, put them to use for the cause. Choose a halo setting - A halo setting will make the primary or center stone appear larger because of the tiny ring of stones surrounding in. Select gold over platinum - Although it is more durable and is in style, platinum is also a very expensive option and for a valid reason. Gold is a lovely alternative that can save you hundreds of dollars. Negotiate the price point - Once you have the funds intact, try negotiating with the jeweler. Depending on current demand, you may be able to save a few hundred dollars or land a steep discount. If you purchase the engagement and wedding ring bundle, the cost savings may be even greater. Reduce the size - Beyond the jeweler, not many will notice you opted for a center stone sized a tad bit smaller than you initially preferred. Search for an antique ring - Find an antique ring at an antique store, auction, or estate sale. You can also use a family heirloom to eliminate costs. Choose a diamond alternative - If you really want the look of a diamond but just can't afford it, look into buying a moissanite stone. Before you decide to set aside two months' pay for an engagement ring, determine what engagement ring features are important to you. Take time to investigate your options and alternatives within a set a price range. Then implement a savings plan to reach your goal.